Comments are the most important aspects of any blog or websites as they engage blog readers and allows users to add content in the comment box and interact with each other, as well as share their content on social media sites. 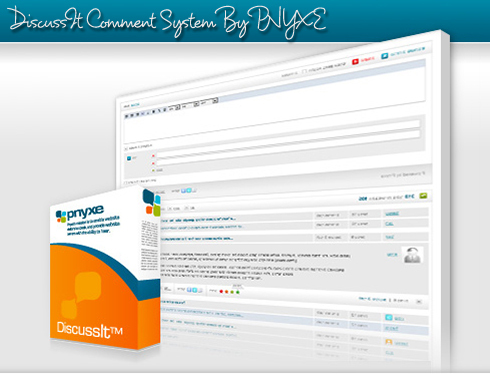 Pnyxe is a free professional comment system and forum widget for websites or blogs. Pnyxe was founded in 2007 and specializes in user generated content. We Provide social widgets for websites, such as comment systems or forums. These widgets prolong visit time, increase traffic and improve search engine optimization (SEO). Through all of these – we increase a site’s revenue. Pnyxe’s widgets are embedded in thousands of websites around the globe, including the NBA team “The Indiana Pacers” and guru3d.com. More customers and testimonials can be found on our website – at pnyxe.com. DiscussIt is the professional comment system allowing visitors to collaborate within your website articles. Make your website more dynamic, within minutes and for free. You will get the HTML comment box which is unique and has proven to increase website traffic and visitor engagement, to prolong visit time and to significantly promote your website in search engines like Google, Bing and social networks Like Facebook and Twitter. Pnyxe is the best network that links all user generated content from page to page and site to site. Each user gets a unique user profile being used in all of the websites. PostRank mechanism automatically ranks the content and the authors and assigns a reputation to each author. Email notifications for authors when someone responds to their post. Visitors can follow authors or a discussion they like. Authors can share posts on their Facebook wall or Twitter account. Efficient management console with multiple content moderators, permissions, automatic SPAM and profanity filters. Search Engines Optimization is one of the most important activities to draw more traffic. Search engines “like” dynamic websites and increase their rank. Pnyxe’s widgets completely blend into the website, both in terms of design and in terms of functionality.Their new feature called Chameleon inherits the site’s design automatically, plus there is a complete self customization option using CSS. ForumIt is the professional forum system which allows you to create forum pages within your website or blogs. With the help of this widget you can make your website more attractive and dynamic, within minutes and for free. This forum system is unique and has proven to increase website traffic and visitor engagement. Most important thing about Pnyxe is that it can be implemented on multiple blogging systems as well as forums. Pnyxe is supported on Google Sites, WordPress, Go Daddy, Tumblr, Blogger, Typepad, Yola Webnode, Weebly and a lot more other platforms too. You can give this comment system and forum widget a try on your blogs or websites. I am sure it will help website visitors to speak, and provide website owners with the ability to hear. Is Blogging A One Man Show? Really?